Learn to fly in the most technologically advanced fleet of Cessna aircraft. Our fleet consists of G1000 glass panel Skyhawks. All of our Skyhawks are IFR-certified. The 172S “Special Performance” edition has a fuel-injected Lycoming IO-360-L2A that is rated at 180 horsepower – 20 more horsepower than the other Skyhawks, allowing superior climb, faster cruise and heavier payloads. Fuel injection engines’ have no carburetor heat, as the carburetor will not ice. Furthermore, power is delivered at lower RPM than traditional engines allowing for a quieter and smoother flight. 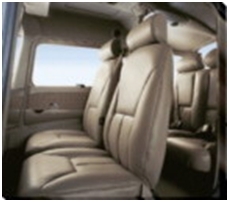 The interior of all of our planes is in superior beige leather, adding a feel of comfort matching modern that found in only the finest luxury automobiles. Furthermore, Cessna 172SP have the latest cockpit soundproofing and vibration attenuation material, allowing for a enjoyable quiet ride. This new Skyhawk has a wide range of upgraded details over older models making it more user friendly, comfortable, durable and safe. With its additional power and its 53 gallons of fuel (9 gph), you’ll have greater flexibility when loading for your cross-country flights. Everything from nose to tail on our SP has been re-engineered by Cessna to create the best-performing Skyhawk ever built.